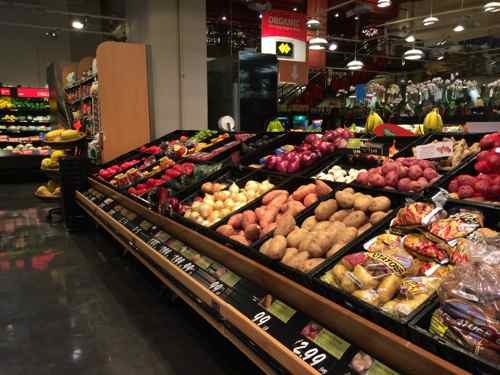 When Fields Foods opened in January on the near south side, just south of downtown, those of us who’ve regularly shopped at Culinaria at 9th & Olive were envious of the produce selection. 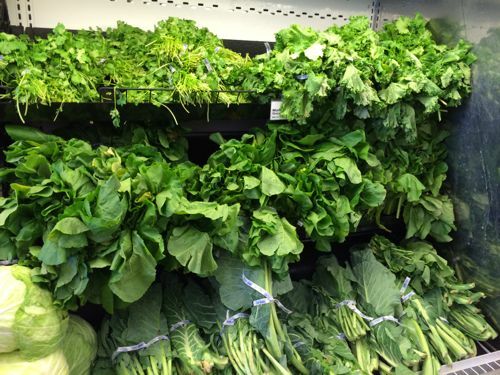 Culinaria also noticed, prompting changes in their produce department. Culinaria closed a walkway to give more room for fruits & vegetables. The windows can be seen in the background. The view of the side behind the bananas. The selection is still lacking compared to Fields Foods, but greatly improved over what it has been. Glad to see management is willing to change when a tiny upstart opens not far away. 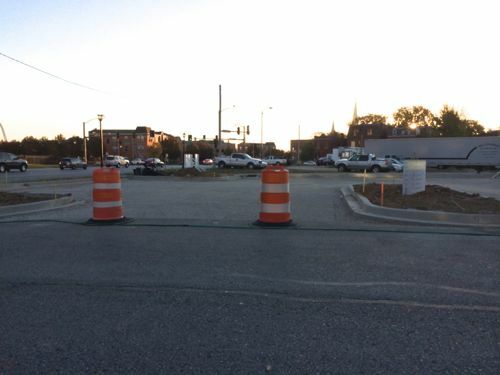 It’ll be interesting to see how both respond when Whole Foods opens in the CWE late next year. With the recent opening of the Save-A-Lot in Jefferson Commons and Fields Foods last week, this former food desert is now a food oasis. 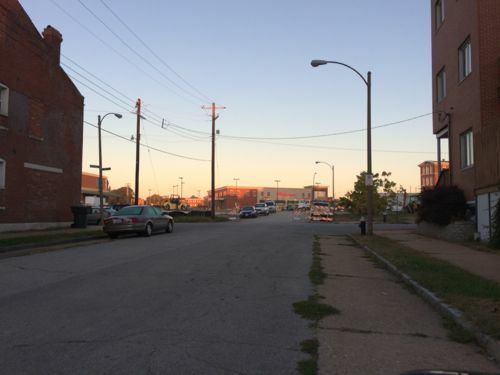 St. Louis still has a number of food deserts, but this is slowly changing. Let’s take a look at the near south side. Jefferson & Lafayette used to have a Foodland, but it closed years ago. On the SE corner an ALDI used to serve the same customer base, but it also closed years ago. Less value conscious customers have always had to go outside the area for their groceries. Now the grocery needs of most everyone should be met with two new grocery stores: Save-A-Lot and Fields Foods. The Save-A-Lot opened in the southern portion of the old Foodland space, now known as Jefferson Commons. 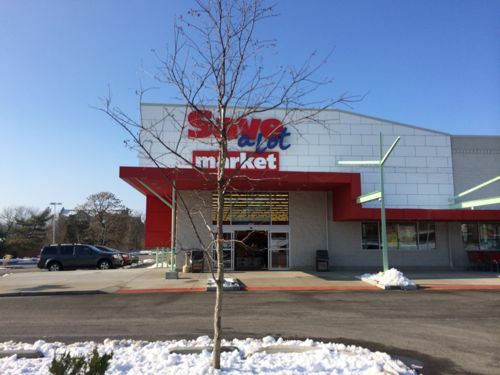 I was at the community meeting in May 2012 when it was announced that Save-A-Lot was announced as the grocery store coming to the development, the reaction in the packed gymnasium was mostly disappointment. Save-A-Lot, based in Earth City, is a subsidiary of Minnesota-based SuperValu. I’m not a huge fan of Save-A-Lot or ALDI’s, but I’m also not too snobby to shop at either, on occasion. 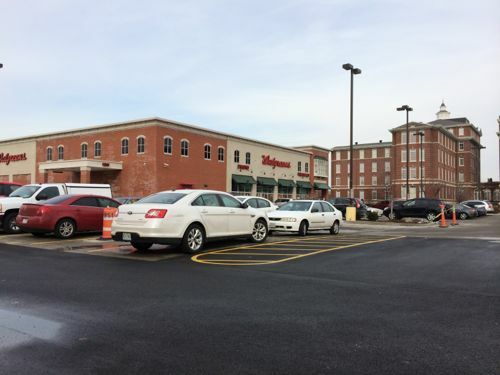 We stopped in to shop at the new Save-A-Lot in December and I was very impressed. Sure, cases of product with the front of the boxes cut off doesn’t make for a special shopping experience. As a label reader, I rarely found an item with a bar code that didn’t contain items I won’t consume (high fructose corn syrup, for example). 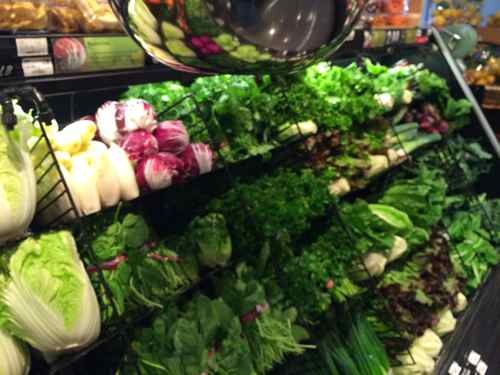 That said, the fresh greens & other produce was much better than I expected, beautifully displayed at the entry too. Nice for the immediate area, but nothing to make me hop on a bus every week to shop. 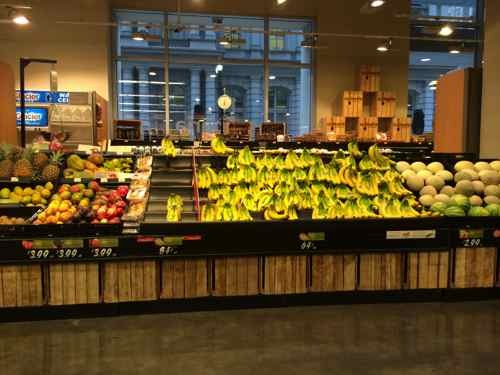 This new concept is what changes the local grocery market. Years ago downtown developer Craig Heller opened City Grocers to help sell more lofts. Better than nothing, it was an upscale convenience store: limited selection with high prices. When Schnucks opened Culinaria in 2009 Heller wisely shuttered City Grocers. Fields Foods is also an effort by a real estate developer, Chris Goodson of Gilded-Age, but the similarities end there. The St. Louis Food Hub is a unique social enterprise that distributes, processes and retails foods from local farmers and food producers. Headquartered in the midst of the city’s historic Lafayette Square district, the food hub is a collaborative effort between three businesses that share the same vision. 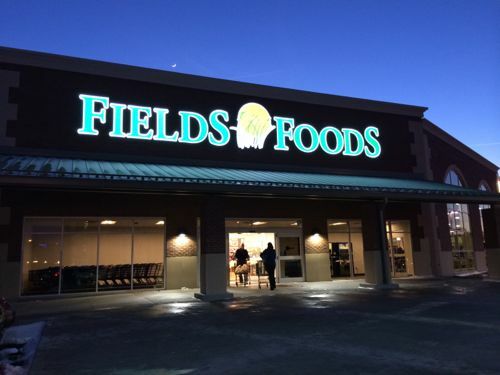 Fields Foods is a full-service grocery store specializing in bringing local foods to local shoppers. Virtual Food Hub is an online platform where local farmers and those who purchase their products connect to do business. Farm to Family Foods is a distributor, processor, and wholesaler of local foods. Together, these Food Hub companies are pioneering the effort to consolidate a regional food system, setting new benchmarks for food desert remediation and breathing healthy life into urban renewal. At the opening they talked about opening more Fields Food stores. Perhaps on the near north side? 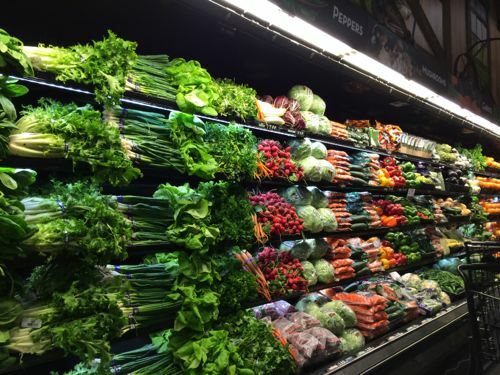 The Best Choice brand is an affordable line of products from Kansas City based Associated Wholesale Grocers, these products are also available at stores like Save-A-Lot and Straub’s. Fields Foods has a nice salad bar, hot food bar, deli, etc. We were there for the ribbon cutting on Friday and returned on Saturday to shop. 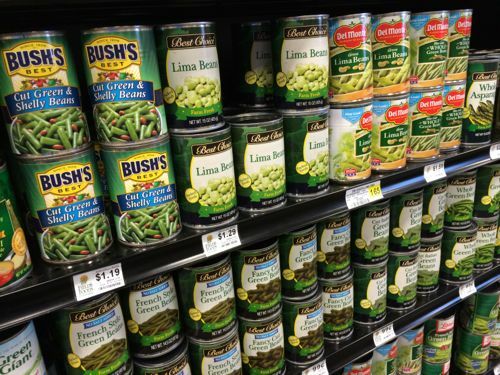 Fields Foods is larger than Culinaria, so it’s able to offer a wider selection of products. I can see myself taking the short bus ride to shop here once or twice a week. Others may stop by when driving to/from downtown. The other store that will be impacted is Local Harvest Grocery, on Morgan Ford at Arsenal. Local Harvest carries a decent selection of organic and local products, Fields Foods will cut into that market. How much isn’t known yet. When Whole Foods opens at Euclid & West Pine in 2015 it’ll be equal distance to downtown as Fields Foods, so it’ll be interesting to see what happens then. I’ve been frustrated by Culinaria’s selection for years, their recent modifications improved things a bit. 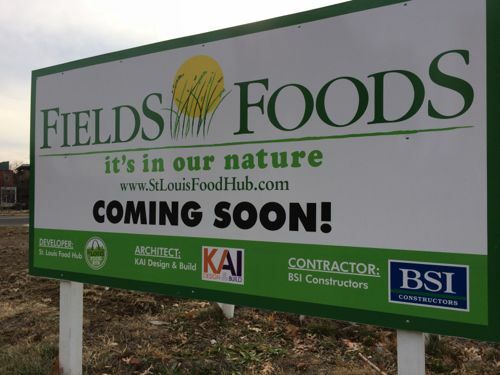 Hopefully Fields Foods will be a wake up call to Schnucks that they can’t continue merchandising Culinaria the way they have been. As mentioned, we still have some areas that are a food desert. These areas could benefit by having a Fields Foods to provide a source for quality food and employment. I also wonder if the changes in the local market, especially the upcoming Whole Foods, will cause Trader Joe’s to get serious about a location in the city? I don’t like the initial site plan of Midtown Station, but the location would be excellent. Also, Fields Foods might fail, predicting the grocery market isn’t easy. 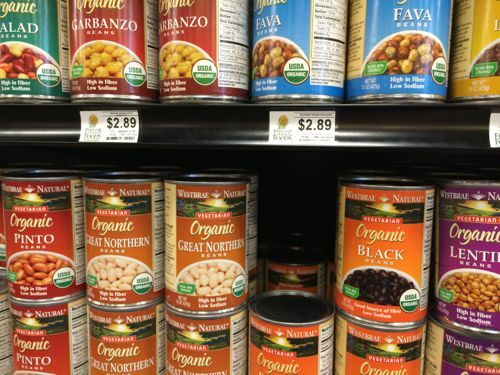 National chain Wild Oats, before being bought by Whole Foods, opened a second St. Louis area store in Chesterfield. Despite the affluence of Chesterfield the store failed and closed. After sitting vacant for a few years, a Trader Joe’s opened in the space. Local Harvest Grocery opened a 2nd location in Kirkwood in late 2012, but it closed less than a year later. I think Fields Foods is making a big enough entry into the local grocery scene that some other stores, like Culinaria, will notice. Given the population isn’t increasing, every dollar spent at a new store is a dollar not being spent at an existing store. 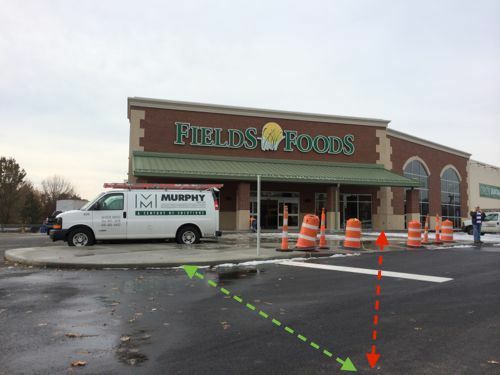 I hope Fields Foods propers and opens new locations, each with good pedestrian access. Hopefully, somehow, I’ll be proven wrong when the grocery store opens January 4th. I visited again last Thursday, and with the site work done I can say it isn’t what I expected: it’s both better and worse! A new walkway connects to the public sidewalk along Lafayete, something I didn’t see on my prior site visit. Could I have been wrong, is this a proper ADA-compliant access route? 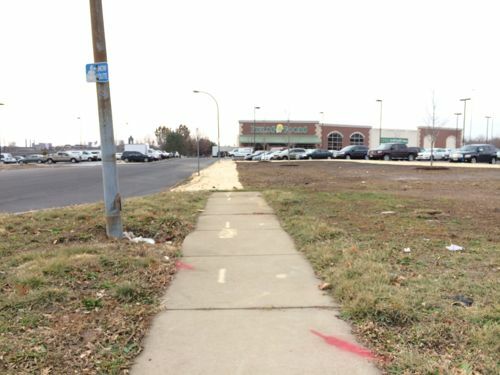 The green line represents what would be a logical point for a crosswalk, the red line is the route wheelchair users, like myself, will be forced to use after entering via the main automobile drive, formerly 14th Street. This is a major conflict with cars. The sidewalk remains from when 14th was a public street. 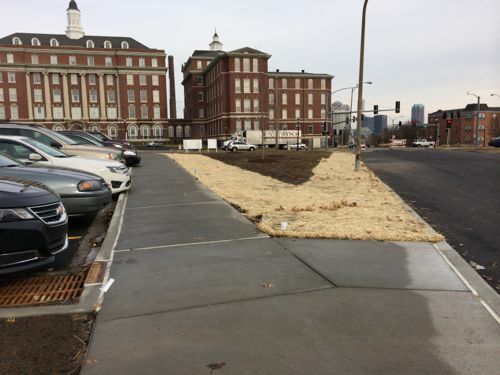 Pedestrians entering via 14th will have to walk in the grass since the sidewalk wasn’t continued. A BSI employee confirmed the concrete work was complete, the rest of this area will be grass or plantings. 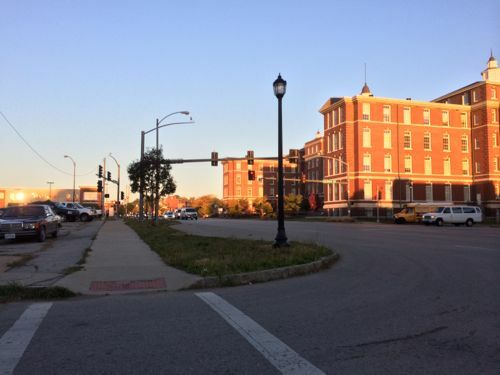 Anyone thinking about pedestrian access would’ve connected to the 14th & Lafayette intersection. 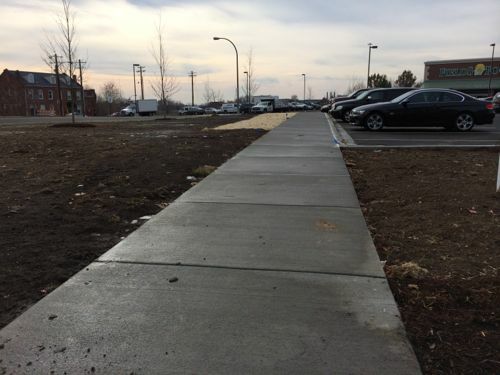 The able-bodied not pushing a stroller or walking with a small child, and approaching from the west, will likely cut through the parking lot (right) rather than use the walkway where the red sign is located. The ADA also requires a pedestrian route between buildings within the same development, which wasn’t considered here at all. 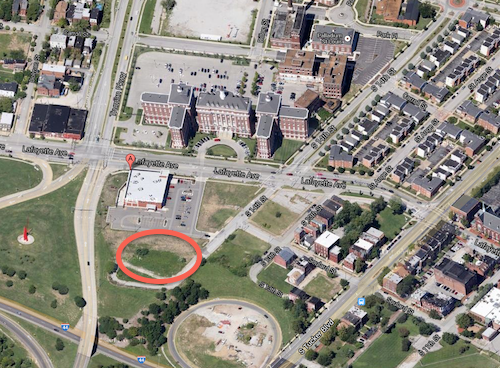 Another building(s) is planned for the land bounded by Lafayete, 13th, Soulard (former), and 14th (former). Not sure who’s a fault for the failure to comply with the spirit and letter of the ADA: owner, architect, contractor? 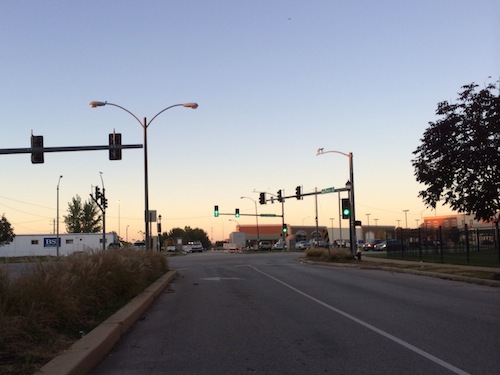 Last Thursday I contacted several St. Louis officials to alert them to the issues I discovered. I suggested they withhold the occupancy permit until the walkway is retrofitted to be ADA-compliant with a curb ramp, crosswalk, and curb ramp on the building side. Providing pedestrian access not accessible to all is a very clear ADA violation. I gave my card to the BSI employee I talked to last week, he said he’d give it to the owner. I’ve not heard back from anyone. It would’ve been fairly easy to design & build this to be highly accessible/walkable from all directions, new construction shouldn’t need to be retrofitted. When the city is vacating public streets pedestrian access from that direction should be provided. The parties involved in the project are collectively incompetent with respect to pedestrian access. The ADA is more than grab bars in the bathroom. I’ll be there on January 4th to see if the situation is improved. 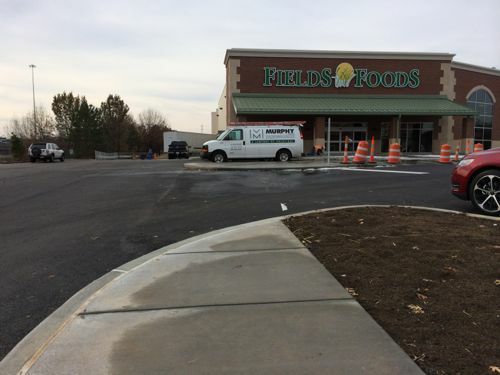 UPDATE 12/23/2013 @ 9:45am — I just talked with Fields Foods owner Chris Goodson, he said workers are correcting the situation. 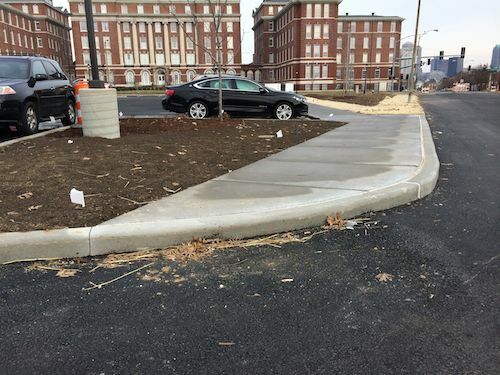 The sidewalk shown wasn’t part of the original design, it was added after the fact after my November post. Last Sunday the house was open to lookers even though an offer had just been accepted, see listing & many photos here. A friend I ran into at the open house said he saw the place shortly after the owner had died. It was “stacked high with papers”, he said. On Sunday all the stuff, including old carpets, had been removed. Ideally the original windows will be retained, appropriate reproductions would be very expensive and cheaper windows wouldn’t alter the look significantly. Apparently the owner had lived there since the 1940s, with few updates. Old boiler with radiators for heat, no central air conditioning. The kitchen and bathrooms were antiques. Fairly original houses like this are very rare, the buyers will have many decisions to make. 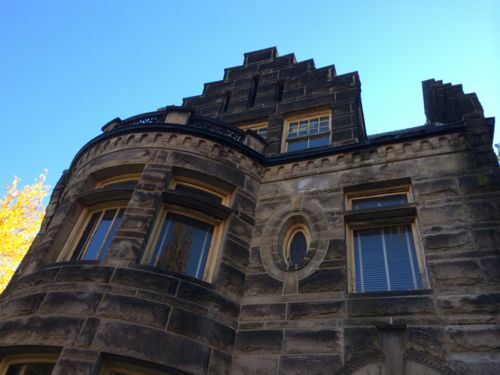 Do they clean the stone exterior to look like it did in 1893? Or perhaps just a light cleaning so some of the old patina remains? 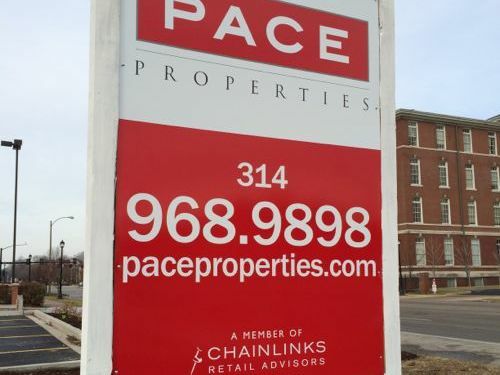 A new grocery store will open soon on the near south side, between Soulard to the east, Lafayette Square to the west, and The Georgian/King Louis Square to the north, Lasalle Park. The I-55/I-44 highway interchange is to the south. Technically this is located in the Peabody Darst Webbe neighborhood, partly named after the former public housing project that were located where King Louis Square was built years ago. Fields Foods is our vision come to life. A full-service grocery store rooted in the heart of historic Lafayette Square near downtown St. Louis. The Lafayette Square area is one of St. Louis’ oldest neighborhoods with historical stores, parks and homes. It’s truly one-of-a-kind, and that’s why it’s the perfect fit for our store. Our team of friendly, dedicated, knowledgeable foodies guides our customers through a vast arrangement of local, healthy, delicious foods that will inspire your inner gourmet. You will walk through lush fields sampling vine-ripened fruits and vegetables. Stroll down urban streetscapes and visit the local butcher and baker. Head down to the docks to our seafood shack and enjoy what truly fresh from the sea means. And if you’re not in the mood to cook tonight, that’s okay. Stop by our prepared food section and pick up a slice of brick oven pizza, a toasty panini, salads and so much more. Need a bit more than a slice of pizza? We have a chef on staff creating restaurant quality dinners for carry out. A Sushi bar and a Wine and Beer cellar stocked with vintages from across the globe and local craft beers completes your experience. Many area residents, tired of having to drive to the grocery store, welcome a neighborhood store they can walk to. 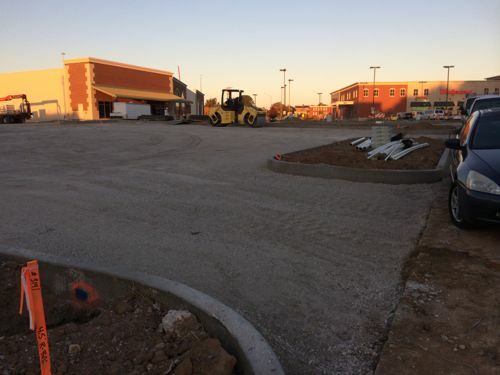 “Can’t wait to have a grocery store within walking distance. 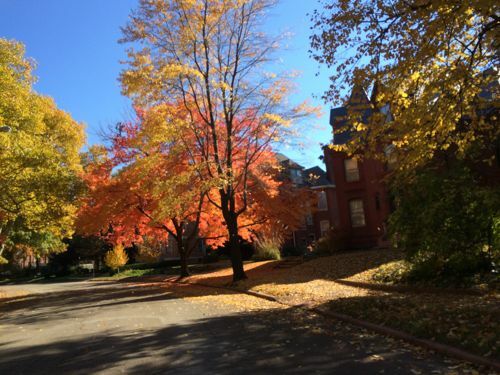 Actually I can see the store from my 3rd floor window.”— Jean C. commented on a Facebook picture. I’m very glad to see the store nearing completion. It’ll provide needed jobs, though jobs may be lost elsewhere as people change where they buy groceries. Sadly, it doesn’t appear any consideration to the many who will arrive daily on foot, some pushing strollers, and even the occasional wheelchair user. Let’s start in the adjacent Bohemian Hill to the east. 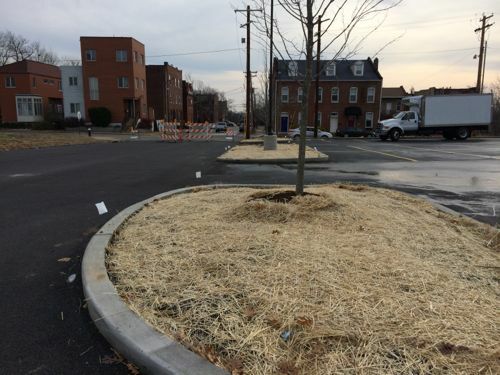 Looking west on Soulard St, the new Fresh Fields is visible on the left, Walgreens center. 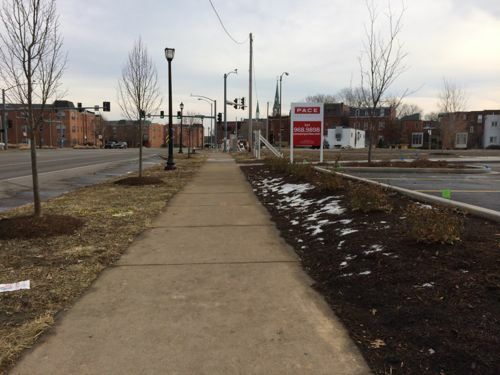 The area has good sidewalks but it takes careful planning to design new developments to encourage walking. Clearly the city has been working with the developers for six years on this project, there was time to figure out how residents of his own project across the street can walk to his new grocery store. The city failed big time by not requiring good pedestrian access.